Another build of SQLCL is out. This one has lots of great things in it. There's fix in there to work with Cygwin for the unlucky people that are still on windows. To run a script simple type: script <script name> If there is no file extension passed along it assume a .js The language is loaded based on this extension. If the language can't be loaded you get a message saying as much "Could not load Scripting Engine for :py" More on how to add the other languages later. 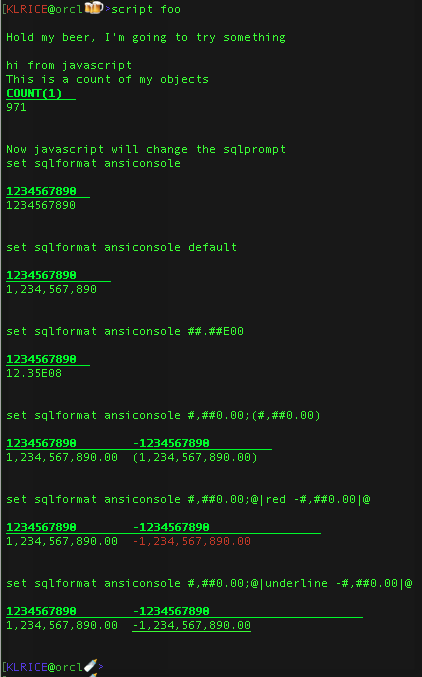 This can be a single statement, an entire script of stuff, or any sqlcl command such as "@numbers.sql"
executes and returns an array(rows) of arrays(row). Here is an example using some of these methods with the expectable output shown below.